Carson Wentz completed nearly 70 percent of his passes and threw for over 300 yards but wasn’t nearly as impressive as those numbers would suggest. Accuracy downfield was an issue throughout the night, and he had a bad forced throw to Alshon Jeffery in the red zone that was picked off by Josh Norman. His best work came when he could get on the move, including his best throw of the night on a deep crossing route to Nelson Agholor in the second quarter. Jason Kelce was excellent out in space in the screen and run game, making a number of key blocks to help spring ball carriers loose. Most notably, he paved the path for a Darren Sproles touchdown run at the end of the first half, taking out two defenders in the process. Michael Bennett was a force for the Eagles’ defense in Week 13, with strong performances both in run defense and as a pass-rusher. His most impressive play of the night came towards the start of the second quarter when he beat Tony Bergstrom in under two seconds with an outside move to get pressure on Colt McCoy. Nobody in the Eagles secondary was really tested much on Monday night against Washington. Rasul Douglas had a nice game, though, when it came to cleaning up underneath throws. The second-year corner recorded a handful of stops in coverage – highlighted by a nice stop he made in the first quarter on a quick screen out to Josh Doctson – and didn’t miss a tackle. Jonathan Allen & Co. along Washington’s defensive line did a good job bothering Wentz in the pocket throughout the first half. 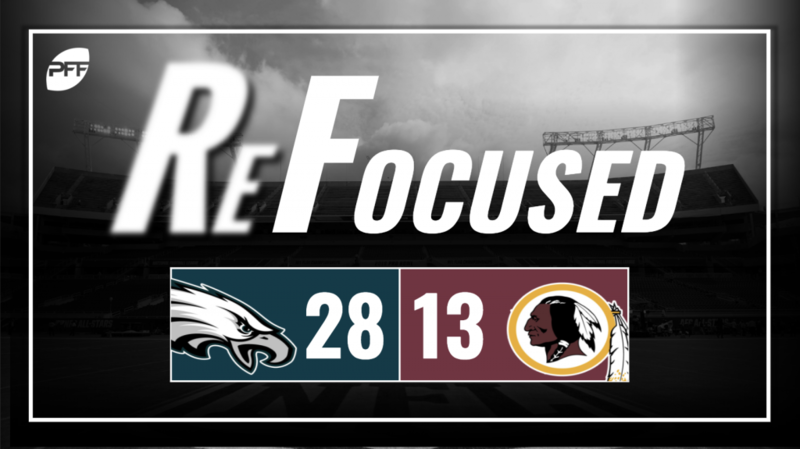 That changed in the second half, however, as Washington barely managed to generate any pressure, allowing Philadelphia to sustain drives and slowly but surely put the game out of reach. Norman came up with the big red-zone interception, Fabian Moreau was the standout in the secondary, giving up limited yardage into his coverage and breaking up a pair of passes. It’s tough to really find any positive takeaways from Washington’s offense in this game. McCoy was alright when he was in there, mostly throwing dump-offs in an attempt to let Washington’s skill players make plays in space. And when he went down, it was much of the same with Mark Sanchez. He didn’t complete a single pass that traveled more than 10 yards in the air. The only receiver to stand out at all for Washington was Doctson. He got off to a solid start, beating Douglas on a deep out route in the first quarter that he ultimately took for 32 yards. He then got away from Douglas again to start Washington’s two-minute drill to close out the half on a slant for a 20-yard gain. Like the rest of Washington’s offense, though, he failed to get anything going in the second half. It wasn’t always pretty, but the Eagles sustained drives, ate up the clock and made enough plays to finish off a team that was down to their third-string quarterback by the end of the night. Washington’s offense was unable to challenge the Eagles’ defense downfield, and they just couldn’t string enough plays underneath to move the chains throughout the night to make this a competitive game.